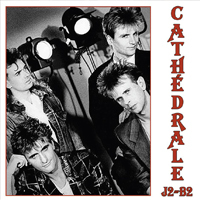 CATHÉDRALE were formed in the late ’80s after JON CAMP had left RENAISSANCE where he had played bass from 1972 onwards. He recruited keyboard player JOHN YOUNG (ASIA/GREENSLADE/SCORPIONS) and with new recruits Brett Wilde and Tony Bodene, they were a band. With a management team in place they got a publishing deal with Warner Chappell and came within a whisker of securing a record deal with Atlantic in USA, but negotiations broke down at the last moment so the band set about recording their debut album in the UK which until now has never been released. They also recruited a further vocalist for the album – Mark Goddard-Parker. A classic late 80’s prog rock album that deserves to be heard as Cathédrale was a stunning band of great musicians with songs on the album that represent a time of considerable creativity. CATHÉDRALE should have taken flight and had some success, it's simple but it all goes pretty well and the gimmick of Japanese music with keyboards on the opening title is to good effect. It's very well sung by Jon, a real success. Jon's huge bass opens 'The Price' with a sound worthy of Chris Squire for a progressive atmosphere, very PALLAS...A collection of beautiful tracks, always with supportive guitar, ubiquitous keyboards and never pompous. CATHÉDRALE leave no imperishable trace for this activity, which makes it a curiosity today, a missing link in the story of progressive music. Yet another obscure album retrieved from the vaults from the folks at Great Britain's Angel Air label. And this time it's from a band that we never even knew existed. Cathedrale was formed in the late 1980s by Jon Camp after he decided to part ways with the band Renaissance. Also in the band were John Young (who had previously played in Asia, Greenslade, and Scorpions), Brett Wilde, and Tony Bodene. In the beginning the band came very close to being signed by Atlantic Records in the United States, but things didn't work out. They recorded their debut album in the United Kingdom, but it was never released...until now. If you like the sound of 1980's progressive techno pop, you will find a lot to appreciate here. This is yet another example of bands who should've been successful but--for various reasons--they were not. Twelve carefully constructed tracks including "One By One," "Paris Is Calling," "It's Really Up To You," and "Crying." Complex in structure but hugely accessible in execution, the results could easily have seen Cathedrale share stages with the likes of Hipsway or Hue & Cry, although there's an undeniably progressive edge also in play. "Element Of Surprise" walks that tightrope confidently, while the more keyboard heavy "A Trick Of The Light" adds a more obvious (if hardly dominant) 70s edge, a small window into the world of Yes opened onto what was undoubtedly an 80s vista.